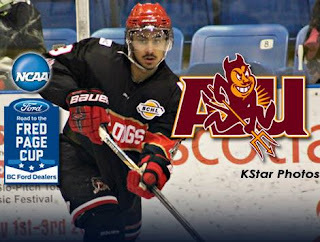 The Alberni Valley Bulldogs are very proud to announce that rookie standout Jordan Sandhu has committed to the NCAA Division 1 program of the Arizona State Sun Devils. Sandhu led all 1999-born players in scoring in the BCHL this season with 40 points (5G, 35A) in 44 games. The next closest ’99 in scoring was Merritt Centennials’ Tyler Ward with 27 points in 52 games. “I decided to play at Arizona State because it is an up-and-coming program that is progressing at a fast pace and on the road to a successful future. The staff is very passionate about their hockey program and I look forward to being a part of that,” concluded Sandhu. The entire organization is extremely excited for Jordan’s commitment and look forward to a great season in 2016/17. Big congrats to Jordan, awesome stuff! And a great excuse to post this beauty from last year. Insane. Insane. Port Alberni, BC – As the Alberni Valley Bulldogs head into their second 2016 Spring Identification Camp in Osoyoos, BC, from April 29-May 1, the Bulldogs announce two roster moves which open two more spots in the 2016/17 season. The Bulldogs send 1998-born defenseman Marshall Skapski to the Merritt Centennials to complete a transaction from earlier this season that saw the Bulldogs acquire forward Ryan Finnegan. Skapski appeared in 52 games for the Bulldogs, producing 1 goal and 6 assists to go along with 42 penalty minutes (including playoffs). Finnegan’s production increased significantly after coming to the Bulldogs, clicking with Bulldogs’ rookie forward Nathan Dingmann. Finnegan scored only once and added 7 assists in 22 games with Merritt. In 31 games with the Bulldogs, he scored 8 times and added 11 assists for 19 points. Finnegan also added 2 goals and 2 assists in 5 playoff games in the first-round series against the Nanaimo Clippers. In a separate deal, the Alberni Valley Bulldogs send 20-year old forward Adam Donnelly to the Steinbach Pistons of the Manitoba Junior Hockey League for Future Considerations. This move is the first step of alleviating the log-jam of 20 year olds eligible to return next season. In 56 regular season games with the Bulldogs, Donnelly scored 7 goals and added 20 assists for 27 points, adding 73 PIMs. In 5 playoff games, Donnelly scored 1 goal. The Bulldogs would like to thank Adam and Marshall for all of their contributions to the team and the community this past season and wish them all the best with their future endeavours. Best of luck to Adam and Marshall, a couple good players and good kids that I enjoyed interviewing and interacting with! Port Alberni, BC – The Alberni Valley Bulldogs are once again holding their annual spring identification camp in Port Alberni this weekend, April 8-10, 2016. Throughout the 3-day camp, over 70 prospects will be working hard to impress the Bulldogsʼ coaching and scouting staffs. In addition to some of the Bulldogsʼ affiliates from the 2015/16 season, there will be a handful of local talent from the Alberni Valley with many familiar names. Friday, April 8th: 4:00-6:00pm and 6:15-8:15pm. Over three-quarters of the prospects in attendance have been by team invite, in addition to a handful of prospects that took advantage of the open registration. As always, the camp is limited to 4 teams, which will help maintain a high tempo through out the camp and give each prospect plenty of ice time and a fair opportunity to showcase themselves to the coaches and scouts. In addition to the camp scrimmages, players will also be put through fitness testing, baseline concussion testing, participate in an educational seminar conducted by Bulldogs educational advisor Tom McEvay, and a separate goalie-only ice session with Bulldogs’ assistant coach/goalie coach Alex Evin.